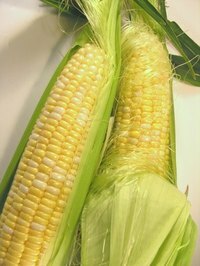 Both cornmeal and polenta are grain-based products derived from corn (or maize), and they have a similar appearance. It's easy to confuse them in the packages lining the aisle of the grocery store or to wonder what distinguishes them from each other. Cornmeal is an ingredient commonly used in baking. Essentially, it's a raw ingredient equivalent to flour. Made out of dried and ground kernels of corn, cornmeal is used to make corn tortillas, cornbread, johnnycakes (or hoecakes), tamales and can be a part of many other recipes. Cornmeal comes in several different varieties. It is available coarse or fine, white or yellow, and it can be enriched and degerminated, or unenriched with the germ intact. Unenriched cornmeal is higher in fiber and is usually labeled as "stone-ground" cornmeal. Very rarely, blue cornmeal, said to be sweeter and more tender, is also available at some specialty food stores and co-ops. When sold in packages or tubes at the grocery store, polenta can look just like cornmeal. Actually, polenta is a food product made out of cornmeal. A traditional part of Italian cuisine, polenta is commonly made by mixing coarse, yellow cornmeal with boiling water and perhaps a pinch of salt. (see References 2) Traditional polenta is cooked until it thickens and almost solidifies. The cooked polenta is formed into a log and sliced like bread. Other polenta recipes are more rich, calling for milk, stock and butter to add flavor to the dish. This creamier-tasting polenta is cooked and served more like a porridge or pudding. Polenta is very similar to other dishes made with cornmeal. Collectively, dishes made primarily out of cornmeal and water are referred to as "cornmeal mush". Besides polenta these foods include grits, hominy and hasty pudding.